A pet sitter is a professional pet-care provider who comes into your home to care for your pets when you are gone. Whether you are away for the weekend, on a much needed-vacation, working long hours, traveling for business, coping with a sudden emergency or just simply unable to provide the attention your pet deserves, a professional pet sitter can be the next best thing to having you there. What is the advantage of a professional pet sitter? There is no place like home—and that could not be more true then when it comes to your pet’s health and well-being. Most pets do not adapt very well away from the everyday routines and comforts of home, where familiar sights, sounds, smells and security are all a part of their everyday environment. It is hard to imagine what must go through their minds in an unfamiliar kennel setting, away from everything they have ever known. The stress and anxiety of not knowing when you will return or why their daily routine has changed can be seen to have an effect on their normal appetite and disposition. As professional pet sitters, our goal is to precisely maintain your pet’s daily routine at home with as little impact as possible. Your pet will receive our full, undivided attention while we are in your home. Exercise, playtime, affection and positive praise will put your pet at ease while you are away. Our focus is always on your pet, but there are also additional benefits to having someone check your house, take in your mail, pick up newspapers and packages and keep your home looking lived-in. This is just one more advantage of a professional pet sitter and another good reason to reserve Doggie Latchkey! Our goal at Doggie Latchkey is to provide the most consistent, highest level of pet care available. In doing so, we strive to ensure that each client has the same pet sitter for each and every visit. When this is not possible, such as in cases of illness or vacation, we have a unique, dedicated back-up system in place to guarantee the same level of care when your regular pet sitter is unavailable. What makes Doggie Latchkey unique is that, in many cases, the owner is your pet sitter! What are your qualifications as a pet sitter? We have taken every precaution and preparatory step to be the best sitters we can for your beloved pets. 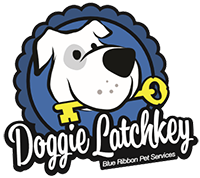 Doggie Latchkey is a registered business with the State of Michigan, fully bonded and insured, so you are protected. It is important to be aware that many liability policies exclude coverage for damage to personal property in care, custody and control. As a professional and responsible business, Doggie Latchkey carries a special policy feature that includes coverage for damage to property in care, custody and control. This includes your pet as well as your home and the property inside it. Furthermore, it includes coverage for lost keys. Third-party protection is included under our basic liability coverage. We are insured through Century Insurance Group, an A-Excellent rated company with A.M. Best. The pet-sitter bonding is an additional protection policy underwritten by Travelers Casualty and Surety Company of America and designed for professional pet sitters. Travelers Casualty and Surety Company of America are rated A+ (Superior) by A.M. Best. Please note we never have had, nor do we anticipate ever having, a situation in which we would have to use this policy, but it is in place for your peace of mind and protection. All pet sitters carry a dishonesty bond for your protection. We will carry proof of bonding and insurance on all initial meet-and-greet visits for your inspection. Our owner has been certifiably trained in CPR for dogs by Advantage First Aid, a proud provider of American Red Cross Health and Safety Training. She is a proud member of Pet Sitters International and the National Association of Professional Pet Sitters. Once you experience professional pet care in your home, you will never worry about being away from your pet again. See our About page for additional details. What is included in a visit? Each visit includes playtime and exercise or walks with your pet. Additionally, the pet sitter will provide a clean water bowl refill, feeding as instructed, treats if allowed and litter box scooping. There are also benefits for your home that we will provide on every visit. Your pet sitter will bring in your mail and newspapers daily. For extended pet sitting packages, we can also adjust window treatments and lights, take in and out garbage and recycle containers, water indoor plants and turn your radio or television on or off as instructed. Following each visit, we will provide you with a detailed log of each visit. Do you care for pets other than dogs? Yes. Our care is diversified; every pet is very special and will receive the attention it deserves. Doggie Latchkey is happy to care for cats, ferrets, birds, fish and a variety of other small caged animals such as guinea pigs and hamsters. What is a “meet and greet”? Before we can provide the highest level of care for your pets, it is important to meet you and your pets. The meet and greet is the initial meeting between Doggie Latchkey, you and your pets. This one-time complimentary visit is scheduled at least three days before your anticipated need. It is a chance for us to meet and discuss all of your needs and concerns. Please allow at least 30 minutes for this visit. If you decide that you require our pet sitting services, a client Information worksheet and pet sitter service agreement will be completed at this time. We can also take possession of the house key, enrolling you in the ready-key service. This complimentary service alleviates the hassle of scheduling meetings just to exchange keys and enables us to always be ready at a moment’s notice should that situation arise. Keys are retained at Doggie Latchkey office under a secure, double-coded system. The ready-key service can also be an advantage should you ever find yourself locked out of the house. What is the ready-key service? This complimentary service alleviates the hassle of scheduling meetings just to exchange keys and enables us to always be ready at a moment’s notice should that situation arise. Your security is extremely important to Doggie Latchkey. Keys are protected under a secure, double-coded system. Names and addresses are never intermingled. This service can also be an advantage should you ever find yourself locked out of the house! The Ready-Key program is included in the service agreement, but clients have the option to opt out of the ready key program if desired. Please note there is a $10 fee when your professional pet sitter must make a trip to your home expressly to pick up or drop off a key to cover our sitter’s time and fuel expenses. Upon arriving home, you will find a checklist outlining all the services Doggie Latchkey has provided. This will inform you the last time your pets have eaten and been outside. We ask that you contact us as soon as possible upon your return. If you don’t contact us, we will call you. We take no chances: If we cannot reach you within eight hours of our last visit, we are obligated to ensure the safety and welfare of your pets and return to your home. You will be charged for an additional visit if you fail to contact us, even if you are home. Many unexpected things can happen that are out of your control, and this small measure can ensure all is safe and sound at home for everyone involved. Remember, Doggie Latchkey is dedicated to the well-being of all pets; we treat them as a member of the family while under our care. We will care for your pets as we care for our very own, and nothing less. If I live far away, will you still care for my pets? Of course! We serve both of Michigan’s largest metropolitan areas, Metro Detroit and Grand Rapids, and we are always expanding. We serve almost all of Oakland County, Wayne County, Macomb County and Livingston County in Metro Detroit, and Kent County and Ottawa County in the Grand Rapids area, so it is likely that a pet sitter will be available. However, if you live outside of our service area, we would still love to care for your pets. We add a nominal surcharge only when absolutely necessary. Doggie Latchkey understands that emergency situations occur and we will do everything possible to meet your needs. It may be necessary for us to charge an additional fee in short-notice situations, however, they will be handled on an individual basis dependent on availability. How do I schedule service if I am a new client? It is fast and easy! You can request service online using our new client scheduling form. Every new client will receive a “meet and greet” one-time complimentary visit prior to services. We will contact you promptly to set up the initial evaluation meet and greet. During the visit, we will discuss the pet sitting agreement and can enroll you in our ready-key program. This time will give all of us a chance to get acquainted, answer any questions you may have about Doggie Latchkey and learn exactly what your pet’s normal daily routine includes. Once you are a registered client, services can be scheduled anytime using the existing client form. How do I schedule service once I am an established client? Existing clients can request service using their online customer portal. Do I have to have another meeting and fill out another service contract every time I need pet sitting? No. Once your service agreement is on file, you can simply request service online using our existing client form and we will follow up with a confirmation. Only new clients require the meet-and-greet appointment, where the initial pet sitter service agreement is completed. Payment is due for all services prior to the start of service. Checks and cash are acceptable. We also offer QuickPay for Chase Bank customers. Ask us about the free, immediate payment through your online Chase account. This service is also available for non-members now, too! Do you charge more for holidays? Yes; a nominal fee will be added during major holidays: Fourth of July, Memorial Day, Labor Day, Thanksgiving Day, Christmas Eve, Christmas Day, New Years Eve and New Years Day. Major holiday vacation sits also have a no-refund policy due to the high demand for sits. Once booked, we can not offer refunds for any of these holiday weeks, (with the week defined as the Sunday prior to the holiday until the Saturday after the holiday). Payment is due upon booking for all holiday week sits. Tips are not required but always appreciated. You may leave cash for your sitter at the time of appointment, or you can add it to your overall bill. 100% of the tip goes to your individual pet sitter. • Daily pet sitting clients who cancel less than 48 hours in advance will not receive a refund or credit so that your professional pet sitter can still be paid when they are unable to pick up additional assignments. • Bookings made for the following holiday weeks are non-refundable: New Year’s Day, Easter, Memorial Day, 4th of July, Labor Day, Thanksgiving and Christmas. These dates book up far in advance and pet sitters are unable to book additional work at those times, especially when a cancellation results in a gap in their route. Contact us with questions or to book service!